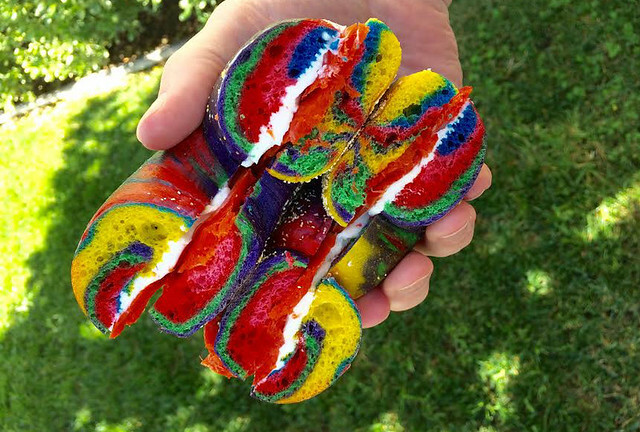 If you thought rainbow bagels were only available in NYC – apparently the epicenter of all cool, trendy food – you can also find them here in good old San Diego. And I’ll tell you where you can find them. Are you listening closely? D.Z. Akins! My recent work travels had my go to La Mesa for a garden photo shoot. I had some time to spare and decided to hit up D.Z. Akins especially after my awesome experience at Downtown’s Carnivore Sandwich. (The owner stressed to me that his shop was not a delicatessen.) I hadn’t been to D.Z. Akins for a while and spotted these multicolored beauties sitting behind the deli counter alongside some green-tinted ones for St. Patrick’s Day. 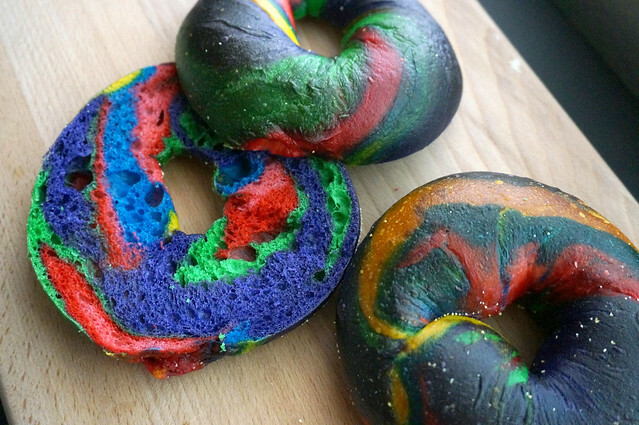 These are not as colorful as the ones available at the The Bagel Store in Brooklyn. The exterior is more of a murky mix of colors but one slice inside reveals a brighter hue. 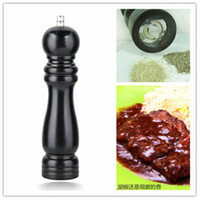 Taste-wise? Eh, I’m really unsure. I’m chalking it up to mind-over-matter believing I’m eating baked Playdoh instead of food. (Stephen Colbert’s reaction is spot on.) After Paul’s incident last year with Burger King’s HA1loween Whopper, I’m hoping that I won’t be in for a shock the next morning. If you want to grab some of D.Z. 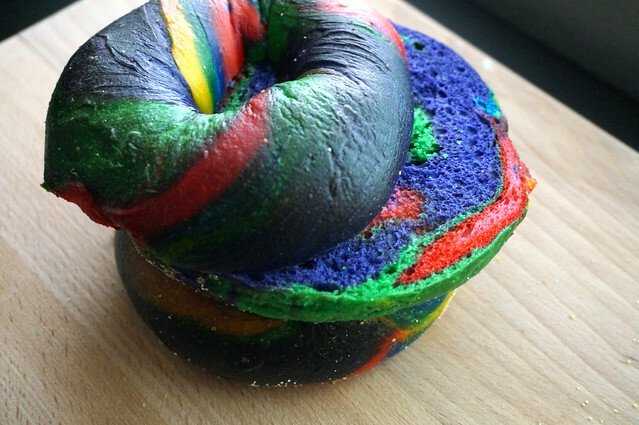 Akins’ rainbow bagels, you can buy them for 90¢ a piece.